The summer season means longer days and more gentle nights for pond owners to enjoy their ponds. 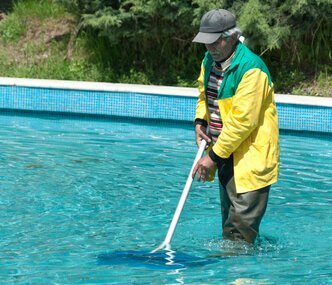 However, higher temperatures also mean that there are certain procedures which should be followed when it comes to pond care and management. Here are some tips for keeping your pond in a pristine condition during the summer months. Aeration pumps can be installed to make sure your pond has plenty of oxygen. Low oxygen levels are dangerous for ponds especially during the summer months. The water will become warmer, and as a result will be less capable of holding oxygen. At the same time, demand for oxygen by the pond’s organisms will increase during summer, necessitating the need of high quality aeration kits that will lower the growth of hazardous gasses while providing lots of oxygen which will benefit both fish and beneficial bacteria. This is a common mistake which is made by novice pond owners during the summer months. It is important to monitor the nutritional intake of your fish, as they will become more active in summer and may enter overdrive mode, which means that they consume more nutrients and grow rapidly. This will result in higher waste production which in turn can reduce the water quality. Low water quality is one of the leading causes of illness among fish and can be devastating to the pond as a whole. The best way to handle this situation is with automatic feeders. These devices will monitor the amount of food the fish get at each feeding and will help ensure they are not overfed. Fresh vegetables and fruit are the best option for koi and you want to give them enough to where they can finish it and then remove anything which is left uneaten. Chemical filter media is important as it can strengthen your pond’s filtration system during the summer months, when it will run at maximum capacity. The greater filtering capability also means that more pollutants will be eliminated from the water which will maintain its quality for longer. Many brands are commercial strength and will remove phosphates. The chemical filter media must be changed on a regular basis to ensure optimal water quality is maintained. You can enhance the performance of your current biological filter by using either beneficial bacteria or biological filter media. Some pond owners prefer bacterial additives which dissolve toxic wastes during summer when water temperatures increase. This is a natural phenomenon that you will certainly want to take advantage of. At the same time, bear in mind that biological filtration supplements should only be used in tandem with higher oxygen levels. Summer is a great time to enjoy the hard work that you put into your pond during spring, but it is important to adapt to the higher temperatures and nutritional needs of your fish in a manner that will maintain the health and vitality of pond. Fitz’s Fish Ponds specializes in pond care for every season – whether it’s summer, spring, fall and winter!